... or How to cross the River Hull on a bike in relative safety: The Commute Part Deux (with apologies to Kern). But not all of the designated cycle lanes are bad news in Hull. 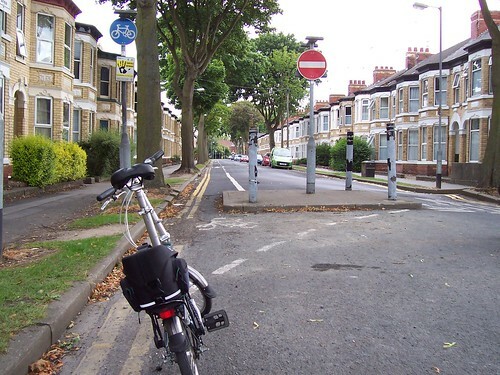 This week Hull was reported as being the 'fourth best cycling city' according to the University of East London. (I don’t know which three places were found to be better for cyclists.) 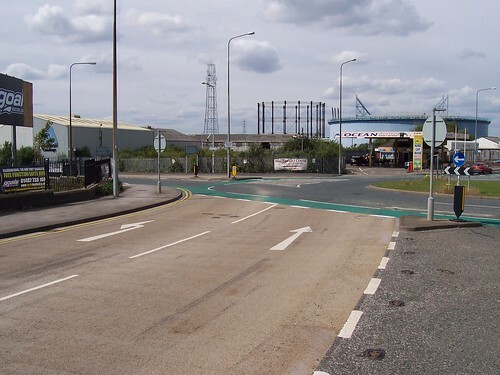 There were a few comments on the web site of the local newspaper along the lines that Hull’s facilities for cyclists actually aren’t that good, but I think that view is unfair. 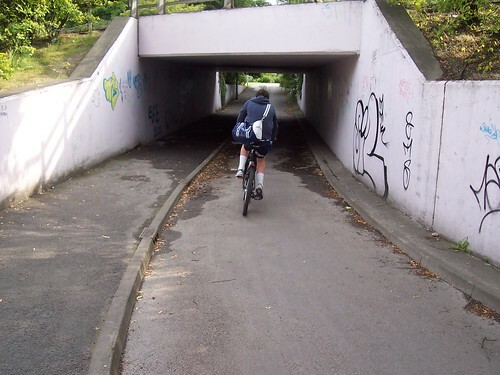 Certainly anyone wanting to ride their bike anywhere near the A63 would have to be very brave, or foolish, but elsewhere the provision for cyclists isn’t that bad at all. As it happens, I tried a new route to work this week, or, more accurately, a new way home. 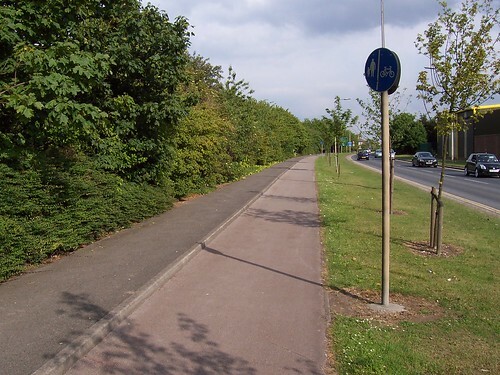 On Monday, after deciding to take the pavement route at that roundabout (I was on my folding bike and I haven’t got the acceleration to get across a lane of traffic whilst signalling right), I cycled home along a more cycle-friendly route. It’s actually best ridden in the opposite direction, and I did that yesterday. I haven’t included images of all the road markings and cycle-specific route that I passed by, but here is a selection. What do you think? 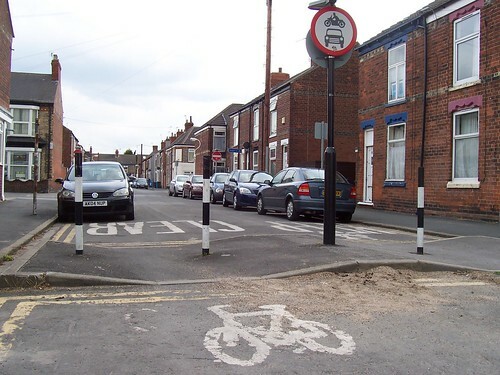 So, just a sample of the cycle provision in Hull, officially the fourth-best cycle city in the country! Admittedly, once you get closer to the Humber Estuary the cycle lanes are little more than painted lines near the gutters of various roads until you reach NCN route 1 parallel to the terrifying A63, but I don’t think the facilities deserve to be rubbished by people who probably don’t realise just how fortunate they are. Posted by Chris on June 11th, 2011. 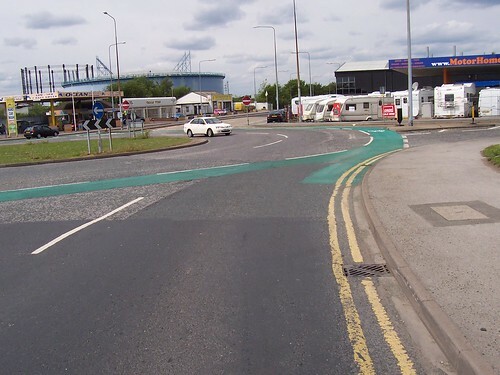 Chris wrote: ... a baffling cycle lane – all green paint, or whatever – on the road around the roundabout at its furthest point from roundabout itself. I've not seen this in the UK. I hope you mean a cycle lane around the outside of the roundabout with priority for cyclists (cars must give way). I'd welcome this, as roundabouts are one of the situations that really do merit separating cyclists from other vehicles. I must say those obstacles across the street in your first three photos are truly hideous. They would be quite pleasant streets otherwise. GRRR! It makes me angry to see such a mess in the name of 'facilities'. It wouldn't take much to do it properly but it seems whoever did this went out of their way to make it as ugly and utilitarian as possible. Simply awful. Point taken about facilities that do actually benefit cyclists and don't spoil the environment, but they are rare in this country. 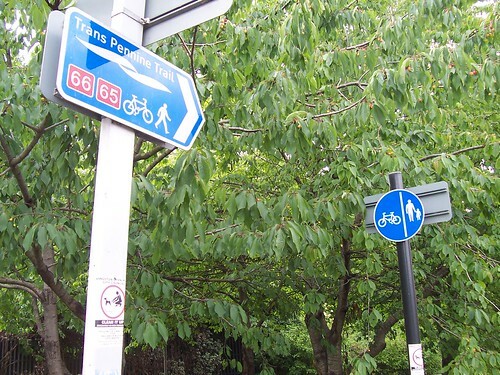 I find cycling in towns in teh UK very confusing, which is one reason why I try to cycle round a town than through it. 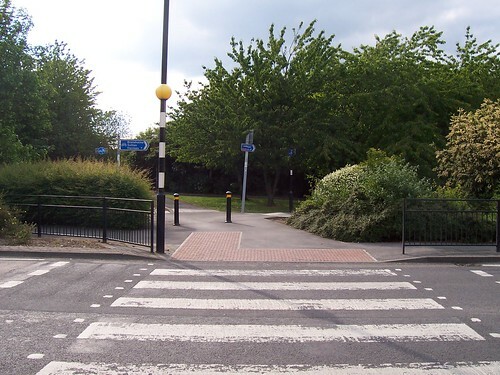 When in the UK, I have been on roundabouts where there is a cycle lane around the outside and these in my opinion are the most dangerous method of navigating a roundabout. I mean, you cycle on the left side of the road to take a right turn? It seems odd, and when ever I have tried this, I end up with a surprised car as I appear from their left side. 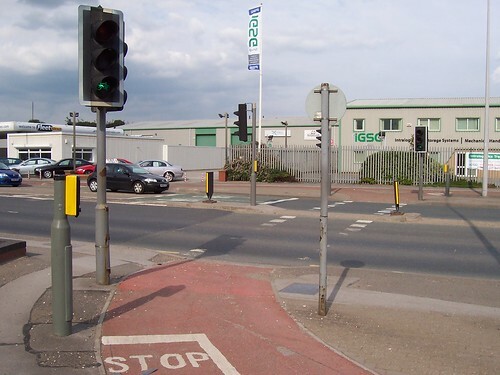 So now in the UK, I get off my bike and I use the traffic light system and walk across at pedestrian crossing points. Not sure really what the answer is, but as I value my life, I would rather take my time and consider myself as very inferior and walk. Roundabouts at home are just those little mini jobs and quite easy to navigate, but not suitable in big towns. That Trans Pennine way thing goes as far as the Pier Head in Liverpool by the way, I use this route when I cycle to Congleton for the Audax ride there in July. Its a horrible route though, very stoney, got glass everywhere and stinging nettles in July too to brush past with your bare legs, I am trying to find an alternative to using it, to get across the bridge at Runcorn, but I still havent found a better way sadly, I am too chicken to cycle across the bridge still. The roundabouts I'm thinking of Mary are those where the perimeter cycle lane is protected for cyclists. If you are, say, cycling straight on, cars turning left are forced to stop and give you right of way until you turn left yourself. As I say, I've not seen one in the UK but they are common in Denmark and Holland. I think they work well. Chris wrote: ... here is a selection. What do you think? 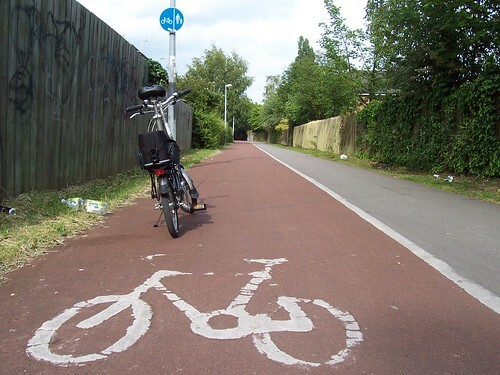 The design of local cycle 'facilities' (crossings, bike lanes, etc) is done in the UK by junior engineering technicians working for the local Council and playing about on AutoCad with no aesthetic training or awareness. Bollards are their virtual aspirin tablets. Got a problem? Drag and drop a bollard (or ten). I think bollards should be banned. The ones in Chris's first photo are monstrous. They look like something reclaimed from the military. Each of those sad examples is perhaps not a big deal by itself but when the thousands of these botched jobs are added up across the whole of the country it becomes a national disgrace, especially as the sum total of it makes no difference to the overall numbers of people cycling as a means of personal transport. Minister Pickles reckons he'll cut the clutter. We'll see. I feel so strongly about this that it will influence determine my vote at the next election! 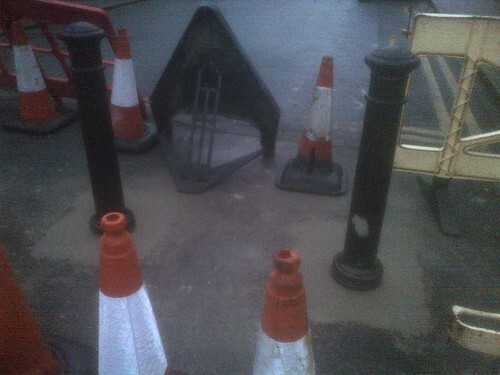 On the subject of bollards, I must admit I'd never given them any thought in the past. I suppose I've just accepted them, but when an outsider points them out as being ugly I would have to agree. Thanks for the photos Chris, and oh dear, what a mess! I suppose a cyclist taking the second exit off the roundabout approaches in the right hand lane (with the arrow pointing straight on) but then makes a sharp left turn on to the green strip and gets run over by a car entering the roundabout in the left hand lane. 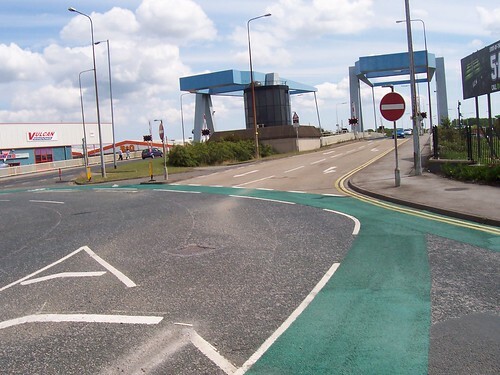 For this arrangement to work safely it must be crystal clear to motorists that the green strip is PROTECTED and that cyclists on it have RIGHT OF WAY and motorists MUST STOP if required. Secondly the geometry must encourage this to happen, and it simply doesn't. I'm afraid this is another design disaster. True, but I didn't see a single road sign warning of changed priorities or telling motorists to give way to cyclists. 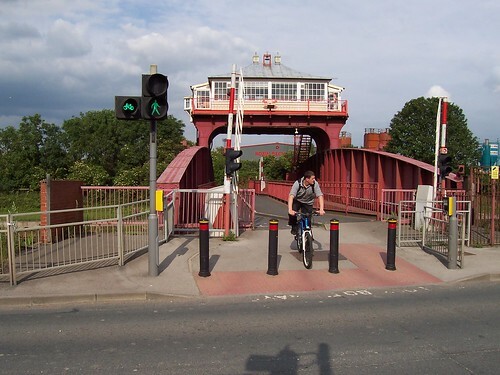 To be fair, a lot of cyclists that go over that bridge avoid the roundabout completely and take the path. I didn't blame them, even before this confusing business. Although anyone caught riding their bikes will presumably face a £30 fine. We had to cycle through traffic circles in Ireland and, being dumb tourists, always approached them with caution. We would slow down, get in the way, impede traffic, point our fingers in the direction we were going, make eye contact, smile, wave our thanks, and grind on through. It was a piece of cake. Kern wrote: ... grind on through. It was a piece of cake. LOL – I know what you mean. Lots of waving does the job when you're loaded with panniers at 5 mph. The cricket wickets are actually rugby posts I think. 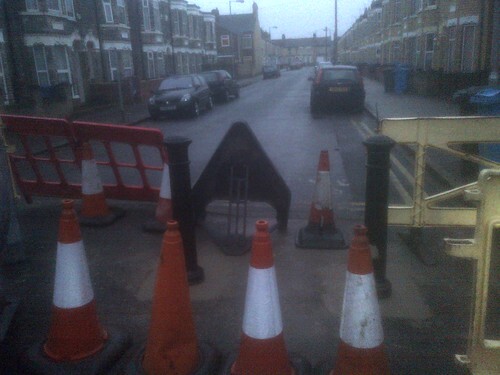 Patrick wrote: I must say those obstacles across the street in your first three photos are truly hideous. Hull City Council acts on withering comments from former architect...? ... or someone needed to use up a budget before year end? Option 2 is my guess. 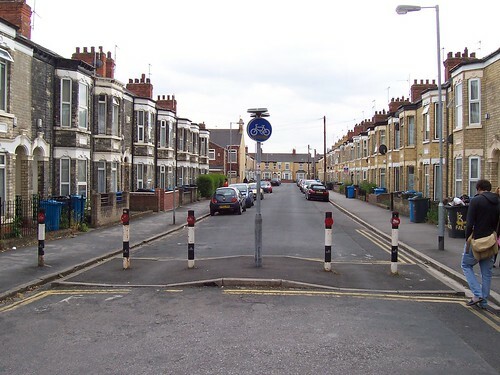 I am still an architect BTW – legally, that is – so if anyone from Hull City Council reads this, well done with the bollards and next year, fix the roundabout.